As successful weekends go, it was not a bad one for Steel City ABC. 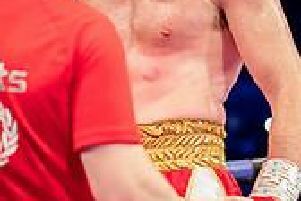 Four fighters from the Darnall club were entered into last Sunday’s England Boxing Elite Development National Finals in Grantham. And all four walked away with gold medals. That came a day after clubmate Dalton Smith walked away with gold on duty for Team GB in Poland. Club coach Grant Smith was understandably delighted. “It doesn’t really get much better than that,” he told The Star. “To go four from four at the finals is something special and I’m really proud of the lads. “It made it even better with Dalton winning on duty for Britain the day before. “I’ve lost count of the number of national titles we’ve won in this gym now. Fir Vale’s Saif Yousaf, Chris Luteke of Manor and Parson Cross brothers Dan and Levi Kinsiona all claimed national title glory. Yousaf, 18, won the 49kg title with a split decision triumph over Timperley’s Michael Mulvey while 19-year-old Luteke added to his Senior Novice Championship win last year by claiming the 81kg title with a unanimous triumph over Lee Morfey of New Astley. Levi Kinsiona,20, earned a unanimous points win over the Army’s Lance Corporal Crawford in the 64kg final while 18-year-old brother Dan stopped Chelmsford’s Matthew Saunders to win the 60kg crown. Coach Smith said: “I wouldn’t put lads into competitions unless I thought they could get to at least the semi-finals. “You never pin all your hopes on a win because anything can happen in there but I was confident in all four of them that they could do the business. “It’s brilliant that they all came through with wins. With Smith’s attention focused on action in Grantham, he could only wait in hope of good news from son Dalton in Poland. Smith jnr is part of Team GB’s talent development section after being identified as part of the podium potential programme. He travelled to Warsaw for the annual Feliks Stamm Memorial tournament and swept through the competition. Smith won ever round in the semi-final against Poland’s Rafal Grabowski before another 3-0 win in the final against Lukasz Niemczyk to claim the 64kg crown. “I don’t really think I boxed to my best,” he told The Star. “But I was pleased to come away with gold. “Things are going well for me at the minute. “I’m off to Macedonia this week for another tournament and hopefully I’ll come back with another gold. Smith travelled to the Olympics in Rio in the summer as a training partner for the Team GB squad and is targeting Tokyo in 2020 for his own debut in the Games.